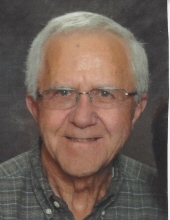 Don Woldt, age 77, of Wentworth, passed away Saturday, January 26, 2019 at the Bethel Lutheran Home in Madison. Mass of Christian Burial will be 10:30 AM on Friday, February 1st at St. Thomas Aquinas Catholic Church with Father DeWayne Kayser as the Celebrant. Visitation will be 5-7 PM on Thursday at Weiland Funeral Chapel with a prayer service at 7 PM and a Rosary to follow. Visitation will continue on Friday at 9:30-10:15 AM at Weiland Funeral Chapel followed by procession to the church for mass. Burial will be in Rose Hill Cemetery, Wentworth. Donald William Woldt was born February 2, 1941 to Ralph & Helma (Olson) Woldt. He attended Rutland Elementary & High School. He moved to Sioux Falls and lived there for a couple of years. While he was there, he met Madonna Turgeon and they were married on June 26, 1963 in Sioux Falls. Don’s dad had decided it was time to retire from farming. This decision allowed Don & Donna to move back to the farm that he grew up on and gave him the privilege of becoming the fourth generation to farm the same land. Along with farming, he served on the Rutland Township Board and ASCS Board for many years. He became a member of St. Thomas Church in 1990. Some of Don’s hobbies were golfing, bowling, following NASCAR, tinkering in the shed, going to farm auctions, having coffee with his buddies in Rutland & Wentworth but most of all spending time with family and going to the grandkids’ sports events and activities. He will be remembered by his wife of 55 years, Madonna of Wentworth; three sons, Brian (Kari) of Wentworth, Michael of Madison and Daniel (Amy) of Slayton, MN; seven grandchildren, Travis, Chelsey, Ashley (Erik) Hill, Mitchell, Brady, Mason & Matthew; sister, Karen Woldt Garrett of Troy, MO and brother, Darold of Colman, SD. To send flowers or a remembrance gift to the family of Donald Woldt, please visit our Tribute Store. "Email Address" would like to share the life celebration of Donald Woldt. Click on the "link" to go to share a favorite memory or leave a condolence message for the family.